Since we had some free time before boarding our 10.45pm ferry, we walked to New Yaohan for dinner. New Yaohan is having a sale and OHMYGOD the queue to the cashier is so long! It winds and winds. 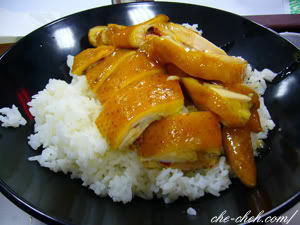 Look nice eh but the chicken is so yucky… full of yellow fats. HK$21 dinner. We reached HK-Macau Ferry Terminal at Hong Kong Island around 12am and immediately took a taxi across Cross Harbour Tunnel to Yau Ma Tei. We reached Caritas Bianchi Lodge at 12.30am!!! I expect the room to be small (Hong Kong mah) but wow I’m really satisfied. The lodge is 20 years old but it is very nice inside. Guess what time we slept? 2.30am leh. god, i miss hong kong. welcome back! 🙂 nice room but whose very messy bed is that? :tongue: what is hk exchange rate? Once you touched down already rushed to HK.. You only stayed at HK island la.. 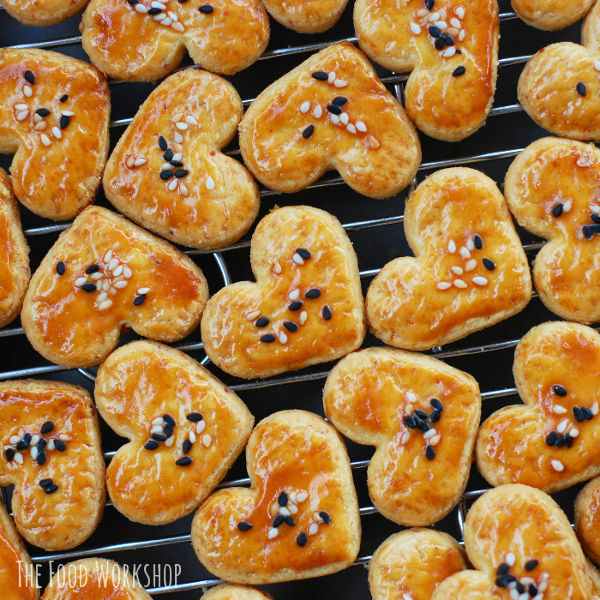 Looking forward for your next post..
Hedo, I tried from a shop called Choi Heung Yuen Bakery. Taste like ours one. 🙁 Actually I wanted to try the original Portugese egg tart at Lord Stow, Coloane but due to time constraint didn’t go there. Dreamcatcher, everyone’s bed will be messy when we get up. About less than half of our rate. Good to see you back! Next time I go to Macau, I ask you for the accommodation and other info, ok? Hcfoo, yes right on time 😀 I’m gunning for Roddick and Nadal. Jam, better don’t ask me about Macau accommodation because the one I stayed in very yucky! 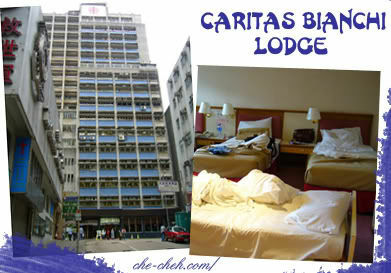 :silly: But I can recommend you Caritas Bianchi in Hong Kong. Of course you can ask other info such as general attractions, where to eat, etc. Monkey Wong, sorry ar still no time to visit you. I’ll show nice photos yeah. welcome back che-cheh! awaits for your HK trip updates. Stumble upon your HK blog whilst doing my research for my HK trip end of this year and have some questions that I hope you can share your experience with me. Can you email me or do you want me to put them here?